Plasmas have a huge range of applications in engineering and science. Plasmas are essential in the modern manufacturing of microchips. Plasmas are key in lighting, they are the basis of arclights that are used as street post lights as well as in overhead fluorescent tubes used in lighting most office buildings. Plasmas are finding their way into the medical industry, from sterilization through exciting breakthroughs in wound healing. Further our sun is a plasma and 99% of the visible matter in the universe is in the plasma state. Because of the complex nature of a plasma, there are a range of models for these systems. From the most detailed to the most basic models: plasmas can be described with fully Kinetic Models (both particle and continuum models), multi fluid models, single fluid models, zero dimensional rate equation models and many things in between. Our group works on a range of these models, seeking to develop methods which will allow us to capture long time behavior in these complex systems. The most fundamental models in plasma science are kinetic models. These models describe the probability of finding a particle at a given location with a given velocity at a given time. Hence these models are six dimensional plus time. We have been working on high order methods for understanding the evolution of these systems from a range of angles. To the left is a set of plots of phase space, velocity verses position. The intensity describes the probability of finding a particle at that location. Top to bottom shows the evolution in time. While a kinetic model carries the most detailed information about the system, many times this is more information than we need. In this setting we resort to using either multi fluid models or single fluid models. There is a direct connection between the kinetic model and the fluid model through what is termed moments, which are specific averages over velocity. These models are three dimensional plus time. To the right is a set of images of a single fluid model describing a shock wave interacting with a dense cloud of plasma. Top to bottom shows the evolution in time. In a plasma, the electrons and ions interact with each other through the long range fields. These fields are set up by the moving charged particles, which in tern are acted on by the fields. Here there are a range of approximations from electrostatic to fully electromagnetic. Bridging these scales is a key challenge for a range of plasmas that behave magnetostaticly, which is somewhere between electrostatic and fully electromagnetic. 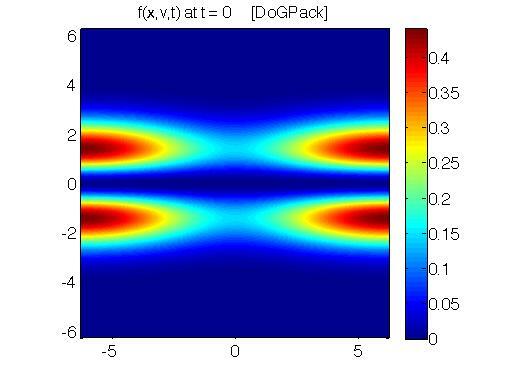 To the left are solutions from a new O(N) fast implicit wave solver we have been developing to bridge these scales. 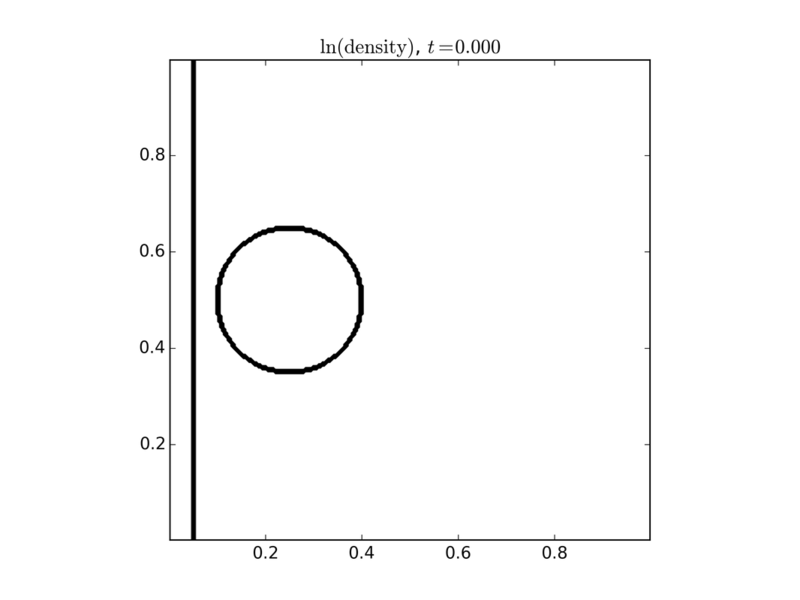 The results are for an ellipsoidal geometry. 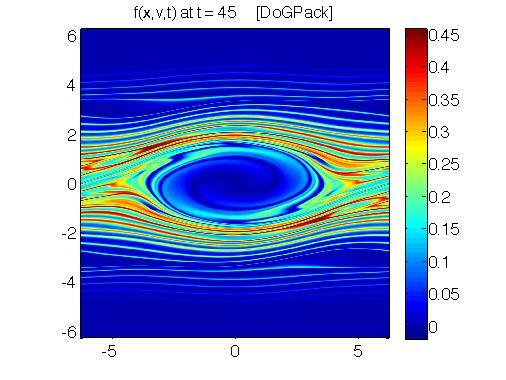 In this work we developed a new class of methods for modeling wave propagation, such as acoustic or electromagnetic waves. The major advantage of this new class of methods is that it facilitates modeling problems where there is a separation of scales in time. The primary application that we had in mind when we were developing the method is in the modeling of plasma, the fourth state of matter. ​In this work we develop a series of particle methods, semi-implicit continuum methods and fully implicit continuum methods that are targeted at accurately solving kinetic models. 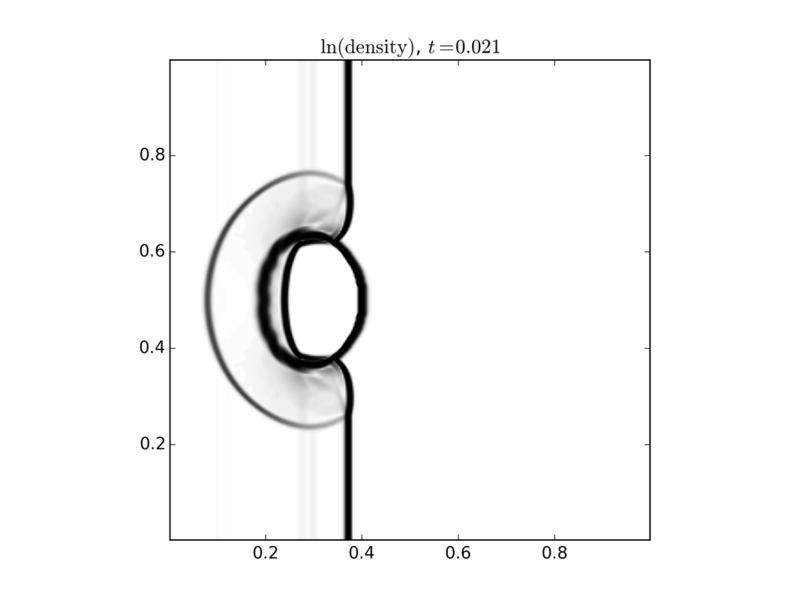 These methods are necessarily high order in space and time so as to maintain accuracy over long time simulations of instabilities that arise in plasma. J. Qiu and A.J. 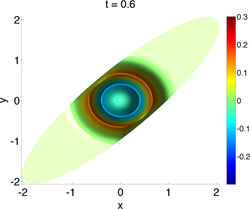 Christlieb, "A Conservative high order semi-Lagrangian method for the Vlasov Equation”, Journal of Computational Physics, 229(4), 1130–1149, 2010. 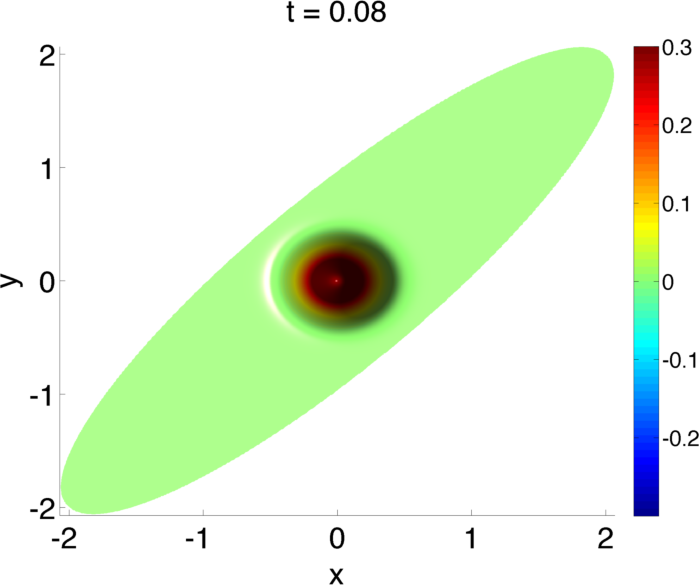 ​In this work we have developed a series of high order methods for single fluid models of plasmas. 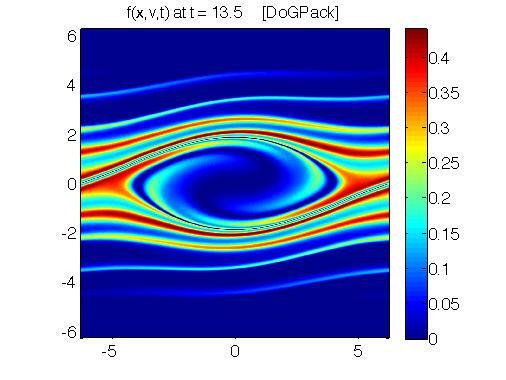 This class of fluid models is known as Magnetohydrodynamics. It is essential in these models that one maintains the divergence free property of the magnetic field, else the numerical simulation will go unstable. The particular type of method we have developed is known as unstaggered constrained transport. 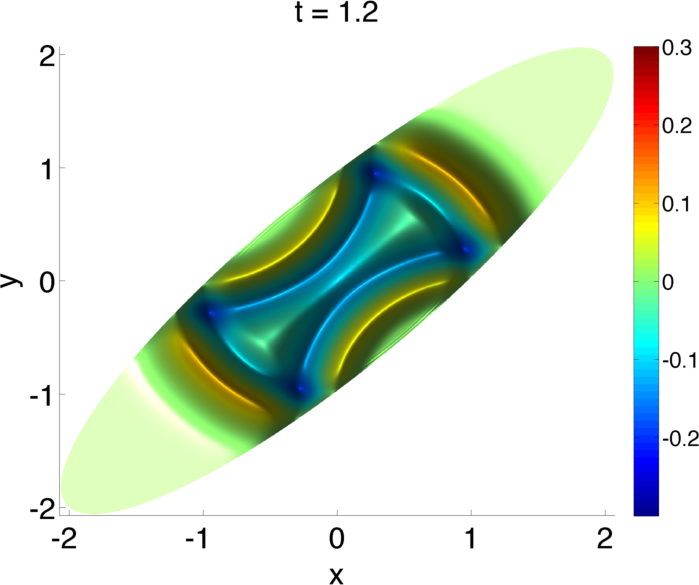 In all forms of methods for Magnetohydrodynamics, some form of auxiliary equation is solved to ensure that the magnetic field is divergence free. The form we have developed in our work is very efficient because we cast the auxiliary equation in the form of a conservation law that facilitates the use of a fast solver to update the solution at each time step.